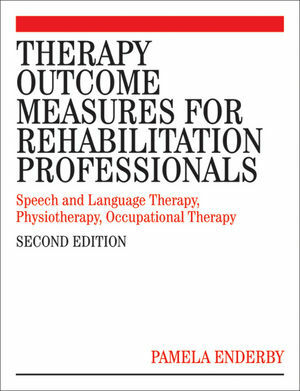 Previously published as two separate books for Speech and Language Therapists and for Physiotherapists, Occupational Therapists and Rehabilitation Nursing, this book has now been updated and expanded and combines the two first editions into one. This fits in with the increased amount of team working in rehabilitation, both in hospital and community settings. The book assists with the practical implementation of gathering outcome data on patient/clients receiving treatment. Over the last decade there has been a growing awareness of the importance of being able to gather information that could assist in identifying specific gains related to treatment programmes. This should not only help to identify areas for resource change, but also enable health care professionals to monitor the effectiveness of their treatments with individual clients. Professor Pamela Enderby, Institute of General Practice and Primary Care, ScHARR, University of Sheffield, UK. ?Pam Enderby is a speech and language therapist and Professor of Community Rehabilitation in the Institute of General Practice & Primary Care, University of Sheffield. ?She has been Chair and Vice President of the Royal College of Speech and Language Therapists (1994-1995 and 1995-1996); President of the Society of Research in Rehabilitation (1994-1996); and Dean of the Faculty of Medicine, University of Sheffield (2000-2003). Dr Alexandra John, Institute of General Practice and Primary Care, ScHARR, University of Sheffield, UK. Dr Brian Petheram, Department of Computer Science, University of the West of England, UK. Brian Petheram is a Director of the Speech and Language Therapy Research Unit and is also Reader in Information Systems at the University of the West of England. Section 1 – Theoretical underpinning & testing. Section 2 – Using the TOM. How to check the reliability of your team. Introducing an outcome measure to the workplace. Training to use the TOM. The Outcomes TOM Computer System. Section 3 – Scales and Data forms. APPENDIX I Therapy Outcome Measures Data Collection Sheet. APPENDIX II Example Of Completed Data Sheet. APPENDIX III Therapy Outcome Measures Data Form Guidance Notes. APPENDIX IV Therapy Outcome Measures Check List. APPENDIX V Learning Prompt Sheet. APPENDIX VI Tom Core Scale. APPENDIX VII Therapy Outcome Measures Adapted Scales. 1 CHILD SPEECH LANGUAGE IMPAIRMENT. 10 LEARNING DISABILITY - Communication. 11 DYspraxia - Children With Developmental Co-ordination Difficulties. 17 NEUROLOGICAL DISORDERS (including Progressive Neurological Disorders). 18 COMPLEX AND MULTIPLE DIFFICULTY. 25 MENTAL HEALTH - ANXIETY. APPENDIX VIII – Adapted TOM Scales in Development. APPENDIX IX - Classification of Disorders – ICD-10.